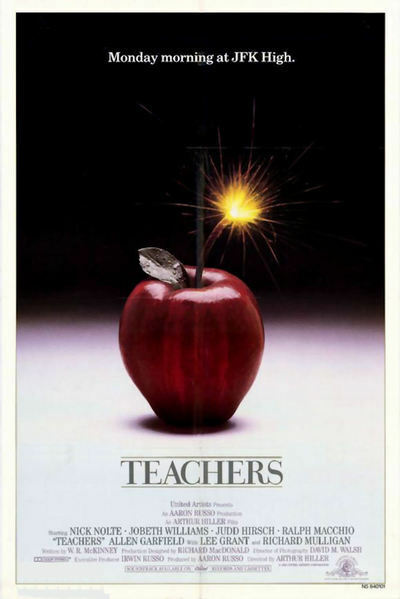 This review is part of the 1984 Blogathon being run by Todd of Forgotten Films. Be sure to check out his site to see all the great reviews for so many amazing movies from the year known as 1984. Thanks Todd for letting me participate! Brief Synopsis – The daily going ons in a typical high school in the US. Is being a teacher really a thankless job? My Take on it – This is one of my favorite movies about high school because it tries to show how crazy and inspirational movies about teachers and students can be at the same time. Eventhough the school portrayed has more problems happening in 90 minutes than some tv shows have all season long, it is still so entertaining watching it all unfold before us. Some of the themes dealt with are: giving unworthy students passing grades, teen pregnancies, narcs in school, guns, sleeping in class, how crazy does one need to be to be a successful teacher, lawsuits, literacy, what are the best methods for teaching plus lots more. There are so many more, but I’ll leave them to you to find out yourself. Nick Nolte is his usual cynical self and is at his best here. I actually think this may be one of his best roles and it’s too bad he didn’t take more roles like this because he fits so well into the character. The rest of the cast are a real thrill to watch; Jobeth Williams, Judd Hirsch, Ralph Macchio, Allen Garfield, Lee Grant, Richard Mulligan, Royal Dano, William Schallert, Art Metrano, Laura Dern, Crispin Glover, Steven Hill and Morgan Freeman are all amazing here. A very young Anthony Heald plays a NARC and it was fun to see him together witb Nolte because of their resemblance to one another in later years. This movie is both funny and inspirational at the same time. They fall asleep in class. Throw ink on each other. Never come in on Mondays. And they’re just the teachers. Bottom Line – Even a black comedy can be inspirational and this is done extremely well. One of Nolte’s best roles IMHO. Highly recommended! I’m always impressed by people who can do that. I think of the number of times I’ve seen “The Thin Man”, yet I can quote only the odd line here & there. this movie actually left a strong impression on me music wise. You just reminded me that I need to update my post because this movie had some AMAZING 80’s music. I had a friend in high school that could quote the entire movie of Back to the future word for word. I wonder if twenty plus years later he still can. You dont know what you’re missing. Check it out!